Déraciné is not only From Software’s first foray into PlayStation VR, but also the first title helmed by Hidetaka Miyazaki in quite some time that doesn’t punish the player for having a sense of unbridled exploration. Set within a boarding school far away from the nearest town, six young children and their headmaster are about to be visited by a faerie and have their lives forever changed. Hidetaka Miyazaki’s storytelling is unmistakable in Déraciné. Much of the darker inspiration to what happens behind the scenes surrounding the boarding school is hidden away for the player to find. In certain story chapters, the player can stumble across books or journal entries and read a brief summary of the world of Rohn and the power of faeries that exist outside of the confines of time. Whatever else occurs throughout the story will be up to the player to decide how these events are intrinsically linked to one another but not every mystery will be plainly explained to the player, as is typical of Miyazaki’s approach to lore. As a faerie, you can only observe and occasionally interact with objects within the world of Déraciné. In many regards, you’re a silent observer throughout the halls as the children go about their daily lives. Much of what the player can interact with in Déraciné are brief vignettes of the past. Memory echoes linger to show an action in progress or some great deed that may again show up later in the chapter. By interacting with these, the player faerie will occasionally get a hint on where to go or a snippet of conversation from one of the children that can give guidance on what the objective for the current epoch is. Echoes are exactly as the name implies, intangible moments of time left lingering by some unseen force. Any items that the children are carrying during an echo can be examined but not taken away. If you happen to spy a key in a child’s back pocket during an echo, you’ll have to track them down within the school itself to claim that key. As Nils will be happy to tell you in an echo, Herman is prone to sticking all manner of objects under his hat. The power of being a faerie in Déraciné is a great responsibility. Working outside of the realm of time and space, you’re free to interact with objects or give the children a gentle push through manipulating the world around them. Once you will a change into creation, it will instantly take effect and those affected will be none the wiser; a faerie is so powerful that a simple change will make those who are under the influence of the faerie’s magic will assume the change is how it’s always been. Faeries are given two rings that the player will use on a constant basis in Déraciné. On their right hand, a ring of life that can take the remaining time from one living being (be it creature, plant or other) and transfer it to another. On the left, a ring that generates a chronometer; once the objective is completed in a particular story epoch, wield it in both hands to finish that chapter and continue on to the next moment in time. Not all of the boarding school is available to explore in each story epoch. Many times, doors to various classrooms or to the inner gardens are locked away to keep the player working towards a singular objective. Often times, there may be rooms that you can only explore for a single chapter, so it’s worth taking the extra time to peek around every cupboard or under furniture for secrets that you might otherwise miss and never get to see again in that playthrough. The setting of Déraciné is absolutely beautiful to explore through with a PlayStation VR headset on. There’s enough detail to the world itself that the player can feel like they’re truly exploring a school from decades ago. The children themselves all have a porcelain doll-like look to them that works in the favor of the VR headset’s reduced resolution, thus preventing the overambitious acts of a studio like Supermassive that tried to deliver on as much realism as possible in The Inpatient but wound up being a jagged mess. I certainly have to give From Software’s art team credit for playing up the strengths of PSVR and delivering an experience that couldn’t be achieved without physically being there next to the cast. Déraciné’s four-hour runtime feels perfect for the sort of experience that From Software was trying to achieve in PlayStation VR. From the first moments of meeting the young students that take residence in this boarding house and the time manipulation powers of the player faerie, there’s plenty of mystery to discover within Déraciné. 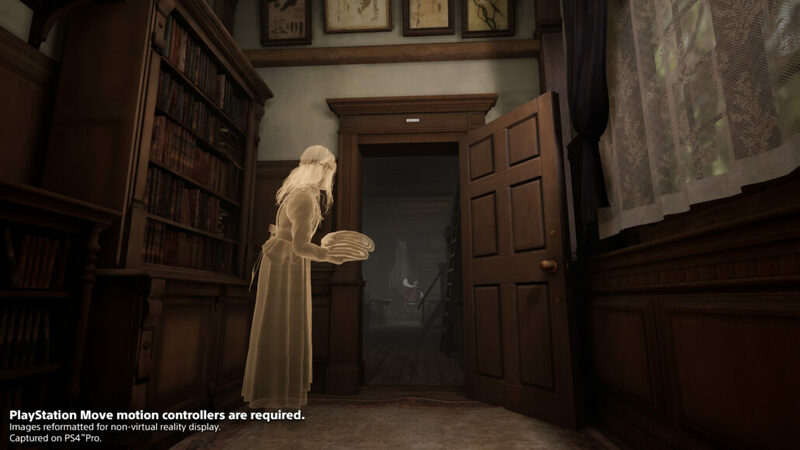 Not all of the mystery within those hallowed halls is clearly presented to the player with a VR headset on, but there are enough bread crumbs and notes littered throughout to give the player a chance to piece everything together. One such mystery of Déraciné is that of the last trophy that PlayStation 4 owners will have left to discover. Nigh all but one trophy will be unlocked by completing each epoch, but there’s one left that left me with a lingering question of what to do next. There’s a type of persistent collectible in Déraciné in the form of eight copper coins, that once deposited within a very conspicuous piggy bank on the first floor of the boarding school, gives a reward that carries over for the rest of the experience. Whether this leads into the requirement for that final secret ending or not is still unsure at the moment, but searching for the criteria to see the final credits was a hunt not unlike exploring The Duke’s Archives for the first time and having that ‘Aha!’ moment when you finally discover the solution. At its heart, Déraciné is a light adventure title with some phenomenal atmosphere and cello music to guide your steps. With the only method of control being a pair of PS Move controllers to guide your two hands and the only method of travel being teleportation to designated spots, Déraciné was a very comfortable experience from beginning to finish. I played through the entire experience in two sittings, with a third added in afterward to find that last elusive trophy, and suffered no discomfort. The only point that may be troublesome for amateur VR enthusiasts is teleporting from point to point as quickly as possible, but if you pace yourself and take a moment to enjoy the sights of Déraciné, it should be a great experience for any level of PSVR explorer. Déraciné is one of those rare VR experiences that I kept thinking about even after taking the headset off. Thoughts of where hints for the missing coins I needed to collect might be hiding or just what the greater story was working towards filled my head for hours in between each session. To see it all end with such a beautifully somber note left me with a greater appreciation of the time I have on this Earth. Review code provided by the publisher. You can purchase the game on the PlayStation Store.